Looking for hot box servicing? Here at ND Brown we provide comprehensive servicing for third party vehicles for all manufacturers and models of hot box. It’s important to keep your hot box in full working order to ensure that road or surfacing repairs are completed safely and to a high standard. If your hot box develops a fault whilst on a job this can severely effect project times and deadlines, which may cause extra costs such as staffing. We complete the same hot box servicing on our own vehicles, and so you can be assured that its completed to our impeccable standards to ensure that your vehicles are safe and road worthy. A single vehicle can be serviced, or we can work with your whole fleet . 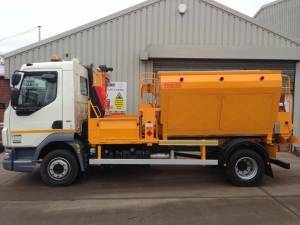 Our servicing arm is extremely versatile and we also service tippers, tipper grabs, cage tippers and 4x4s. Our hot box servicing and repair can be completed countrywide and is completed by our highly skilled mechanics who have a wealth of experience working with hot box vehicles. If something is wrong with your hot box, we keep a wide variety of parts onsite which includes augers and bearings to ensure we can complete your repairs quickly and the best price possible. We complete our repairs throughout the country through our three depots and can usually fit you in for a hot box service on short time scales. If you would like to find out more about our servicing then please fill in our servicing request form, or get in touch with a member of our expert team. For any type of hot box servicing, use ND Brown for fast, efficient and expert results.